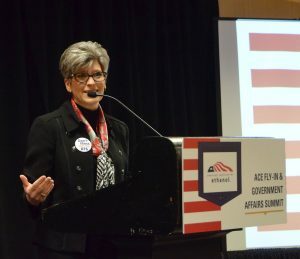 Senator Joni Ernst has earned the title of “ethanol champion” for her work on behalf of the industry to protect the Renewable Fuel Standard (RFS), but she took the time today to visit with people she thinks are the real champions – the grassroots farmers, producers, retailers and investors who make up the American Coalition for Ethanol (ACE). “You are all out there making a difference,” said Sen. Ernst in her address to ACE members in Washington DC. During an interview, Sen. Ernst says she believes the White House is “backing away” from the RIN cap idea and leaning toward sending the whole issue to Congress to resolve. “We have had a strong coalition in Congress as well that pushes back against any efforts to weaken the RFS,” she said. Listen to her remarks and my interview below where the senator also comments on the omnibus bill and trade issues.